With Super-TIGER launched and flying, the team down on the ice is going to start slowly leaving one by one, until about a little over a week from now when it will only be JohnE and myself. Wednesday marked Dana's last day on the continent, and, having been here four times before this trip, he was happy to get to go back home. Since our shift went to 2am and we ended up on a conference call that didn't end until closer to 2:40, I managed to sleep through the magical 12:12:12 on 12/12/12 time. After having lunch (about 15 minutes after I woke up), I went back to my room and eventually decided to take a hike up Observation Hill. Observation Hill towers over McMurdo and, I'm assured, provides great views of the surrounding area. During Robert F. Scott's Discovery expedition of 1902-04, the hill was used as an observation point, hence the name. Wednesday was a little overcast when I started climbing, but by the time I was halfway up the summit was covered in clouds. I kept going hoping that it would clear up, but when I got to the top views were very restricted. It was a pretty reasonable hike--I went slow on the way up and still made it to the top in about 40 minutes. At the top is a wooden cross that was put up in 1913 to honor the members of Scott's party that died on the return trip from the South Pole in March 1912. I took a longer but less steep way back down the mountain for the bottom half. This road took me by the fuel station, and I saw people at work on a new fuel storage tank that's currently being built. Back in town, we worked our typical 7pm-2am monitoring shift in Crary Lab. 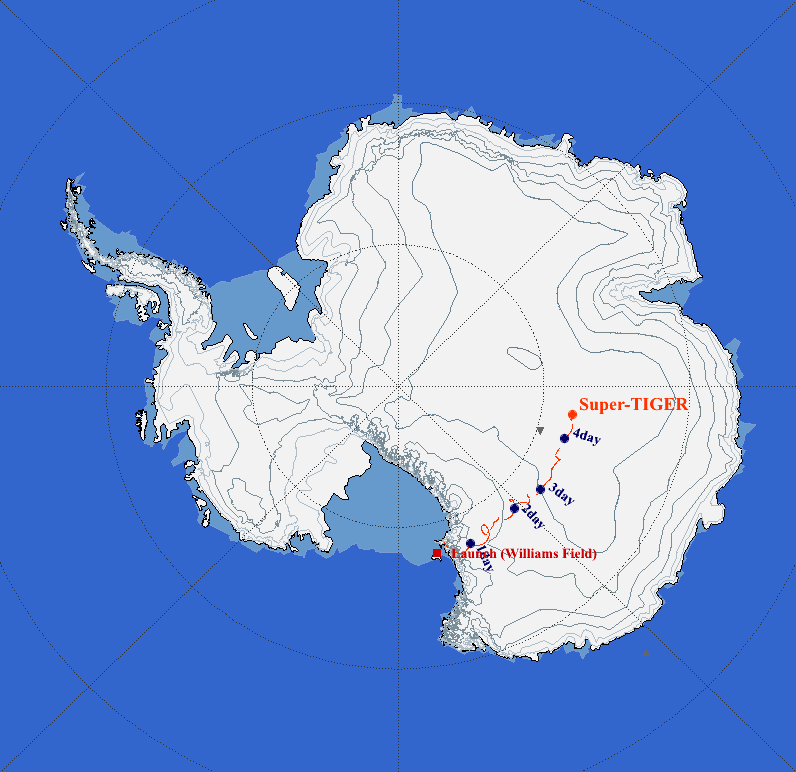 While Super-TIGER stayed pretty close to McMurdo during the first day or two of flight, we've definitely started into out "orbit" around Antarctica. Did you know that you can shorten your long urls with Shortest and get cash for every click on your shortened urls.